Free Ground Shipping in the 48 Contiguous States! 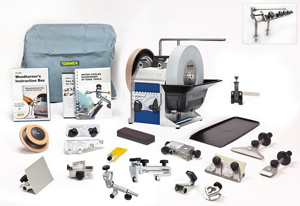 The T-8 System includes the Angle Master, Honing Compound, Stone Grader, Diamond Truing Tool, New SE-77 Square Edge Jig, Handbook and Instructional DVD. The Tormek T-8 is backed by a Seven-Year Warranty. The New T-8 includes the following new features: Cast Zinc Frame and Motor Mount; Cast Zinc Frame with integrated Tool Rest Mounts; Cast Zinc Internal Drive Wheel; Tighter Tolerances on Tool Rest Mounts; Height Adjusting Water Tray with Removable Magnetic Water Tray Scraper. The T-8 also includes New SE77 Adjustable Square Edge Jig. The Cord has been relocated for easier machine rotation. The Support Bar on the T-8 model is compatible with the previous Tormek Jigs and has improved accuracy with the new cast body of the T-8. New Advanced Water Trough has been further improved with a screw lift for an easier fitting and a magnetic scraper for efficient cleaning. 7 year Warranty, Made in Sweden. The Tormek T-8 is rated for continuous use and has a vast array of specialty jigs available so you can quickly and easily sharpen virtually any tool in your house,or workshop. The heart of the T-8 is the Tormek SG-250 10" x 2" grinding wheel turning at a slow 90 rpm through water which acts as a lubricant for faster grinding while it continuously cools the tool edge to prevent "bluing" the metal. After grinding, the 8-3/4" x 1-1/4" genuine leather honing wheel gently removes the burr and hones the edge to razor sharpness.